You are currently browsing the BestOfBothWorldsAZ.com blog archives for the day Thursday, September 23rd, 2010. Skin Medica’s Vitalize Peel has been a popular skin treatment for many years, however you may not be familar with Skin Medica’s newer Illuminize and Rejuvenize Peels. 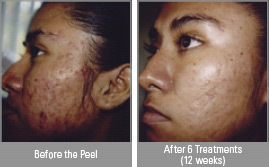 SkinMedica Rejuvenize Peel™ launched in October 2009. Rejuvenize Peel™ is a blend of Salicylic Acid, Lactic Acid, Resorcinol, Panthenol and Isoceteth-20 with the addition of .3% Retinoic Acid. Deeper than SkinMedica Vitalize Peel®, Rejuvenize Peel™ produces a moderate amount of peeling for 2-5 days, and can be repeated every 4-6 weeks. Blend of Salicyclic Acid, Resorcinol, Lactic Acid, Panthenol, Isoceteth-20 and Retinoic acid. Paradise Valley Skin Klinic offers all of the Skin Medica Peels as well as Skin Medica products.